LINGMELL is a well-appointed double-glazed house accommodating 7 comfortably (and more with occasional beds) and is converted from part of the outbuildings of a country house set in a wooded estate of 6 acres (Lake Bank). 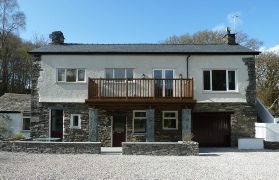 Effectively, it is two connected self-contained flats, one upstai rs and one downstairs with easy access. There is a strictly NO SMOKING policy in the house. It has been completely refurbished to a high standard in 2013 by a local builder and now comprises 3 bedrooms – 2 double bedrooms (one of which has an en-suite bathroom) and one bunk bedroom. The roof, interior walls, plumbing, electrics and decorating are all brand new, as are the main kitchen, family bathroom and en-suite bathroom. The heating is by modern Rointe Digital Electric Radiators. The house also benefits from a new patio and balcony which have also just been installed at the front of the house which faces south onto the large garden. Wi-fi has also been installed. Upstairs contains the main accommodation, with an open plan lounge/ dining room/ kitchen, the main bedroom, a bunk bedroom and main bathroom. The lounge has two sofas, an open fireplace with new oak flooring, mantelpiece and window seat, a 40” television with freesat & HDD, DVD player and hi-fi. It has a dining area with French windows which open out onto the large balcony (with a 6-seater patio set) overlooking the garden. 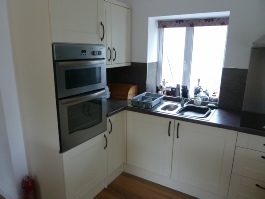 The kitchen is well-equipped with a double oven, hob, microwave and fridge. The bathroom has a shower/bath, WC and wash basin. The main bedroom has a double bed and a full size single bed. The bunk bedroom has two full size bunks. Downstairs, there is a double bedroom (with an en-suite bathroom including WC, wash basin and large shower), a living room (2 cottage armchairs and a second television also with freesat and a DVD/VCR player) and a second kitchen (with a fridge/freezer, washing machine/tumble dryer, cooker and microwave). There are 3 bookcases in the living room which are full of videos, games, books, maps and local guides. A patio made of local slate is at the front of the house, also with a 6-seater patio set. The Rointe radiators are in all the rooms, and can be individually set to any temperature. There is a large immersion heater for hot water. There is parking space for 3 cars in front of the garage. This is in a very quiet corner of the Lake District, just off the A5084 Lowick to Torver road, by the bottom end of Coniston Water just north of Water Yeat. It is half an hour from the M6 junction 36. Public boating and fishing is possible all around the lake. The Old Man of Coniston can be seen from the house. A walk through the grounds brings you onto the Blawith fells where there are good walks and excellent views of Coniston Water, the mountains and Morecambe Bay. There are 4 kayaks and a Canadian canoe, with equipment, in the integral garage, which are available for use by arrangement and at the user’s own risk (see this page). The owner belongs to Lake Bank Boat Club and access is allowed to a private pier which is on the lake just across the road from the house. Well-behaved pets are welcome, provided that they keep off the furniture. All towels, tea towels, pillows and pillow cases, duvets and duvet covers, sheets and blankets are provided, as well as an oven glove and bath mats. 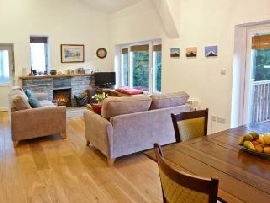 It is expected that the house is clean and tidy and left in the manner holiday-makers would like to find it. Use of the telephone and emergency food is extra and there is a box by the telephone for this purpose. All breakages should be notified and made good. Lingmell is primarily for the owner’s own personal and family’s use but is being made available to others at other times by special arrangement. The market town of Ulverston is 9 miles away and meets most needs. Coniston is a popular village 6 miles at the top end of the lake where there is a tourist information centre, outdoor shops, small food stores and a boating centre. Local restaurants and pubs are excellent and full details are available at Lingmell. The Lake District is very scenic and caters for all abilities of walkers. 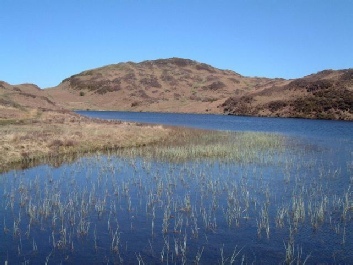 The best local walk is up to Beacon Tarn and Beacon Fell (allow 2-3 hours round trip). There are excellent views down the length of Coniston Water and to The Old Man of Coniston and Dow Crag. For more energetic walks, The Old Man of Coniston is the nearest mountain. A good day's walk takes in any combination of The Old Man, Dow Crag, Swirl How, Greyfriar and Wetherlam. All mountains are accessible in the day with a short drive. Details of walks are available in Lingmell.